Rhinophyma is a condition causing over-development of the oil-producing glands of the nose, producing a thickened and red bulbous appearance. It can be due to untreated rosacea, but this is not always the case. It is almost exclusively seen in men although rarely, women can be affected. 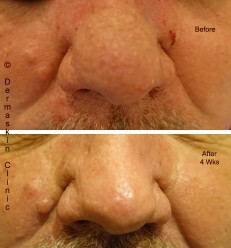 At Dermaskin we can treat rhinophyma using our ablation laser treatment. This is a one-time treatment that involves lasering the excess tissue and restoring the nose to its former size and shape. This client was thrilled by the results and initial healing occurs VERY swiftly over a week or so and the area is fully healed by 2-4 weeks. Only trust our highly experienced doctors at Dermaskin to perform technical and sensitive procedures such as Rhinophyma Ablation. Normally only a week for the nose to look quite normal again and full healing can take as little as 2 weeks. The nose has an amazing ability to heal due to the highly vascular nature of the area – there are many blood vessels that supply the skin over the nose. This means that the nose heals faster than almost any other part of the body. Nothing out of the ordinary needs to be done. The area just needs to be kept clean and after treatment the area should be kept cool and dry. A thin layer of vaseline can be applied to the area to prevent over-drying. Vaseline is also an excellent barrier and can be reapplied frequently over the days following the procedure.